It might not be traditional American Labor Day BBQ food, but it is a favorite around here. If there is soy sauce involved, my kids will always eat it. Add some peanut butter, and Little J is in heaven! I like to serve this with either grilled zucchini or asparagus. Set aside a little bit of the marinade before you add it to the pork and use it to marinate your vegetables for about half an hour before grilling. Pork tenderloins almost always come two in a package at the store. Our family at home keeps shrinking, so now I usually divide the marinade in half and freeze one tenderloin in the marinade to cook another day. This also makes a good freezer meal to prepare ahead of time and have on hand for busy days. Combine Marinade ingredients. If you will be grilling vegetables as well, set aside ¼ cup of the marinade. Add remaining marinade to the bag with the pork tenderloins. Place the meat in the refrigerator and marinate for 4-6 hours (up to several days). Remove from refrigerator 30 minutes before grilling. Slice squash lengthwise (or trim asparagus ends) and place in a Ziploc bag with reserved marinade for about 30 minutes. In a Pyrex measuring cup, combine all of the Peanut Dipping Sauce ingredients except for the peanut butter. Heat in the microwave for 45 seconds. Stir in peanut butter. Add additional water if the sauce is too thick or too strong. Heat for an additional 30 seconds, just before serving. Prepare and oil grill. If you are using a gas grill, leave one burner of the grill unlit so that you can cook the tenderloin with indirect heat (so it doesn’t burn). Remove the tenderloin from the marinade and place on the unlit side of the grill. Close grill cover. Grill the tenderloin for about 5 minutes per side (4 sides) until the internal temperature registers 145-150°F in the center. Remove from grill and let rest for 5-10 minutes before slicing. While meat rests, grill the marinated vegetables over direct heat for about 3 minutes per side. Slice pork diagonally into ½ – 1” slices. 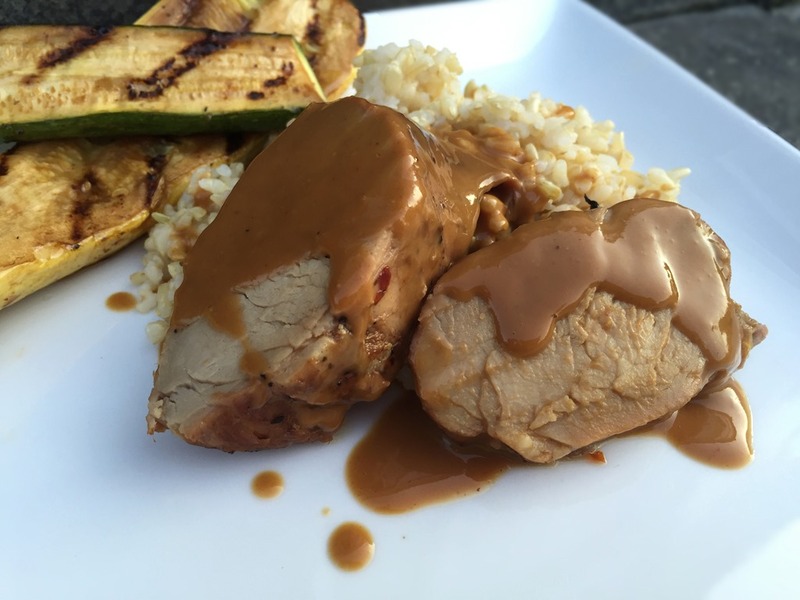 Serve the pork and grilled vegetables with peanut sauce and hot steamed rice. **FREEZER NOTE: If you do not plan to eat both tenderloins (or just want to prepare a freezer meal ahead of time), place tenderloins in separate freezer bags and add half of the marinade to each bag and place in the freezer until ready to cook. The peanut sauce can also be prepared ahead and frozen. Thaw completely in the refrigerator before cooking. Do not freeze raw vegetables.